On our way back from the Masca Gorge we visited the town of Icod de los Vinos and in it the famous ‘Thousand-Year-Old Dragon’, or simply ‘El Drago’. 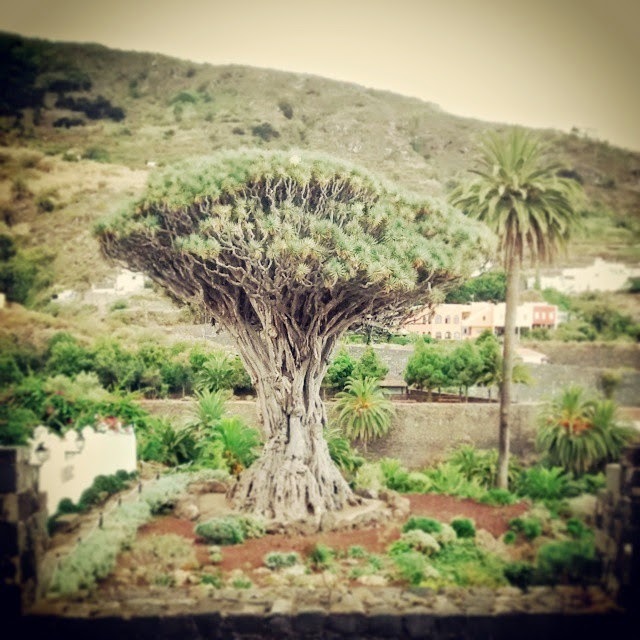 It is a dragon tree, the symbol of Icod and it attracts thousands of tourists every year. Nobody knows the tree’s actual age. Usually we can get an indication from the annual rings in the trunk however this species does not have these. It may have stood there for thousands of years or it might be only a few hundred year old sapling, the estimates vary between 500 and 3000 years. Apparently in the 18th century a German scientist called El Drago the oldest living thing on Earth. I guess the locals didn’t want to offend anybody so they called it The Thousand-Year-Old Dragon, just to be on the safe side. Even though its age can be disputed, one thing is certain, it sprouted from the blood of a slain dragon. And the proof for this is the fact that the sap of the tree, which was used for healing purposes, mummification and other, similar types of monkey business, is blood red. Just to give you some numbers, according to Wikipedia El Drago is 22m high, the diameter of its lower trunk is 10m and its weight is about 70 tons which grows by about 3 more when the tree is in bloom and displays its flowers. Now that would be a sight to see! Unfortunately the core of the trunk has rotten away but it’s been filled with cement to give it support. El Drago Milenario is listed as a UNESCO world heritage site and can be find just opposite the Church of San Marcos in Icod de los Vinos. If you’d like to get up close and see some more interesting flora in the small park that surrounds it you have to pay the 5 euro entry fee. However there’s a great view from the Plaza de la Constitución. El Drago is not the only one of its kind, in fact there’s another dragon tree close to the square. For many years it had been thought that the tree’s habitat only includes the Canary Islands however recently a few of them were found in Morocco, too. 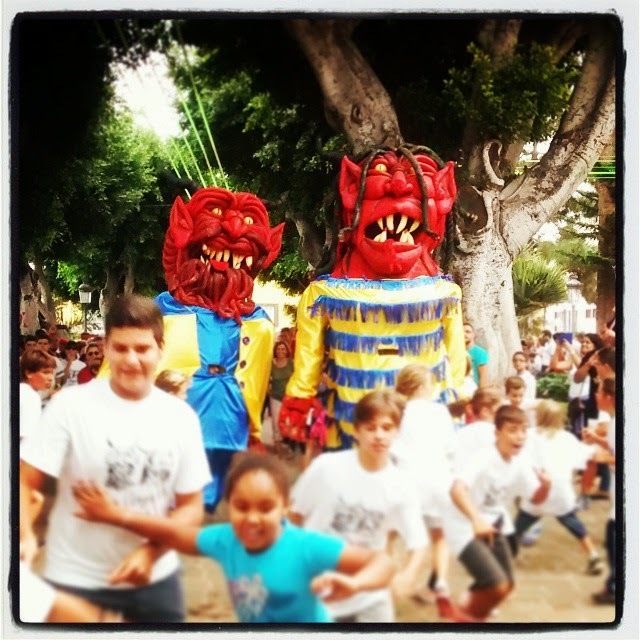 On our way back to the car we witnessed the Fiesta del Diablo y la Diabla. Unfortunately I couldn’t find any reference to the festival’s origins. If you know, please tell me in the Comments section.